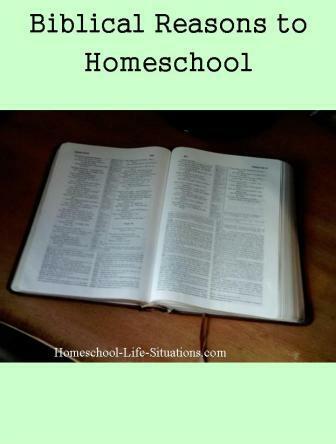 Recently I have been asking myself if there were biblical reasons to homeschool. I started homeschooling because I wanted my children to have a Christian education. But is that enough? What does the Bible say about education? Here are some of the verses I have come up with. Just after the list of the Ten Commandments in Deuteronomy 6:7 the Bible states that we are to teach the precepts diligently to your children. We are to do this in the morning, at night, and when we walk by the way. The idea of teaching the commandments of the Lord throughout the day is also repeated in Deuteronomy 11:19. In the Ephesians 6:4 fathers are to bring up their children in the training of the Lord. One of the biblical reasons to homeschool is to be diligent in training our children to love the Lord. Proverbs 2:6 says that the Lord give wisdom, knowledge and understanding. James 1:5 states that if any one lacks wisdom he should ask God. 1 Corinthians 1:20 asks; Where is the wise? Where is the scribe? Where is the disputer of this age? Has not God made foolish the wisdom of the world? The home is a good place to teach our children to follow God and his wisdom. Proverbs 22:6 says to train up your child in the way he should go and he will not depart from it. In 2 timothy 3:16 we read that scripture can equip man for every good work. The home is safe place to discover what your child's interests are and how he can use his talents to serve God. Children also have the responsibility to listen and obey their parents. Two passages that come to mind are Proverbs 1:8 and Ephesians 6:1-3. The home is a good place for children to learn to love and obey their parents. Colossian 2:8 Beware lest anyone cheat you through philosophy and empty deceit, according to the basic principles of the world, and not according to Christ. Although the Bible does not come out and say specifically that we should homeschool it does talk about training our children.